A book and video set. In 2003 Brian Clarke, the noted metalsmith, taught how he makes ribbon torcs in the ancient way, using deer antlers. He had just recently rediscovered the process, and it forever changed the way I think about Iron Age metalwork. At the time I expressed the hope that he would one day write a book on the topic, and I am now happy to say that he has not only done that, but also produced a wonderful companion video. When book and video sets are produced together it is rare that the video is anything like as good as the book, happily that is not the case here. It is a straight forward presentation, start to finish, showing Brian making a torc, with a clear voice-over explaining the work as it progresses. In places where it is helpful there are computer animated diagrams illustrating the topology of the forms as they develop. The animation never distracts, but only illuminates the amazing transformation of a lump of metal into a beautiful helical form. But what may have impressed me the most is the subtle use of ingenious filming to help make details clear and understandable. Here is an example: Early on in the video there are some shots in which the camera and the torc remain stationary, but the lighting slowly shifts to reveal details that would otherwise be hidden in shadow. It is a curious paradox for historians that our sources are only as good as our understanding of them, while at the same time our understanding is built upon those very sources. Outside of our areas of specialty and language we are at the mercy of translators and editors, and even if we are in a position to read a manuscript in a rare books library in a language we understand, it will likely be a copy of a copy of a copy, of an original, dating from hundreds of years before that document was penned. This situation is similar for artists, craftsmen and re-enactors. We therefore look for editors and translators that we trust, and hope they have published an edition of documents that are of interest to us. One such edition for me is Theophilus’ On Diverse Arts, translated by John G. Hawthorne and Cyril Stanley Smith, and dedicated to the great metalsmith and historian Herbert Maryon O.B.E. The inexpensive Dover edition is often sold as part of a set along with De Rey Metallica, and The Treatises of Benvenuto Cellini, which is a good deal, though I find On Divers Arts to be the most useful of the three. This volume consists of three works, one on painting, one on glass work, and the third and largest on metalworking. The first two show a keen understanding of their subject, though not personal mastery. The third, for the most part reads as a work based on hands on experience. In fact it is telling that the chapters in the painting and glass texts that have the most detail are those having to do with metals and equipment. The chapters on gold leaf for painters and on making iron molds for casting caming for stained glass are fine examples. 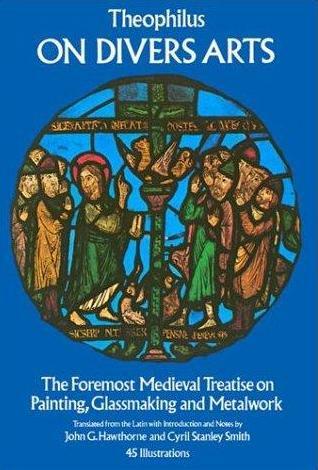 Even so, some of what is contained is clearly medieval folklore, the chapter on “Spanish Gold” comes to mind, however the bulk of the work is a straight forward description of how to accomplish practical tasks. It seems likely that whoever Theophilus Presbyter was, and there is much debate on this matter, that he was in fact a metalsmith. Of what is contained within On Divers Arts there is much that I cannot recommend recreating, the making of a skin tone pigment by burning lead carbonate, and adding sulfide of mercury for instance. However there is also a great deal of practical advice that may be directly applied to the modern studio, as well as being of use to the historian or re-enactor. Most importantly this book gives us a better understanding of the methods used by past artists. Even in our most modern artwork we are working with the accumulated experience of thousands of years, and the better we understand that experience, the deeper our understanding of our art forms, and with any luck the better our own original work. It is not in my nature to speak ill of any book good or bad, but every now and then there will be a volume published on a topic about which I care very much which, though badly flawed, contains much useful information. One such book is Ironwork, by J. Starkie Gardner, ISBN 0-905209-00-1, first published in 1892, with many subsequent editions. It contains much information both practical and sometimes very esoteric. For instance, it gives estimates for the number of tons of iron worn away from British railways by the action of train wheels in the year 1890. Where this book really shines is in its illustrations and photo’ plates of antique iron objects. The photographs are clear black and white and most have been cropped to the edges of the subject. The illustrations are detailed and lovingly rendered. However, I found it very hard to read through. It is my practice to try to judge every work in the context of the culture and period in which it was created, and understand the backgrounds, biases, and beliefs of the creators. On the other hand, this book is strikingly condescending in tone and racist in outlook even by the standards of a colonial empire. An example from the very first paragraph reads: “The operation in its simplest form, as it is still conducted by many of the savage races of Africa or semi-barbarous peoples of Asia, consists in filling a closed or partly closed oven, or even an open hearth with the ore and charcoal.” I have read other works from Victorian England, and though they bear all the hallmarks of that place and period, they do not strike such an arrogant tone, nor do they show such careless disdain for other cultures. One other reservation I would have against a full recommendation of this book is on the grounds of some of its technical nuances. Though the author is clearly an accomplished historian, and avid antiquarian, it is clear that he has never himself worked iron, and so simply gets some of the details wrong. This is to be expected. In his time and place men who were scholars simply were not iron workers, and it is to his credit that he took the time he did to gain the understanding needed to publish a book on the topic. As a counterpoint to the above review, there is another volume on a related topic which I would like to recommend with enthusiasm. It is humble in tone, scientific in approach, and thorough in the treatment of its topic. 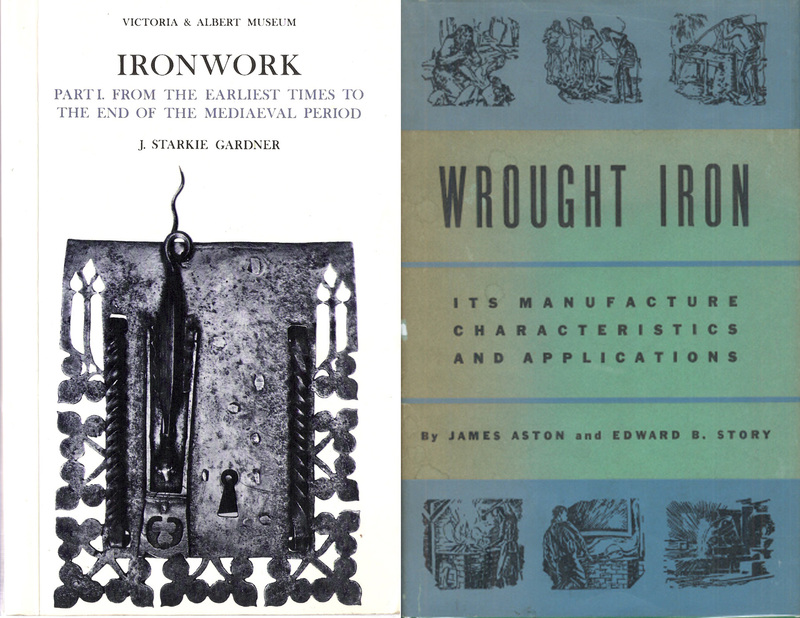 This book is Wrought Iron, Its Manufacture Characteristics and Applications, by James Aston and Edward B. Story, published second edition in 1939 by A.M. Byers Co. Pittsburgh, PA. When published the price was $1, and I have seen copies selling today for less than $10, so it is an inexpensive addition to a metalsmith’s library. In addition to the topics indicated in the title the authors have included a concise history of the evolution of the iron-making process, and detailed information on the proper working of wrought iron. This book starts at the beginning with a definition of its topic. “Wrought iron is best described as a two-component metal consisting of high purity iron and iron silicate -” The tables and photographs are clear and illustrative, especially the many etched micrographs of differing metal samples.